A 1966 Bedford VAM coach with Duple Viscount bodywork, owned by Browns of Ambleside. Homepage. This page: Does anyone remember taking trips around the Lake District in this Bedford VAM Duple Viscount? This slim leaflet from the late 1960s/early 1970s features a Bedford VAM coach, with bodywork by Duple, on its cover. 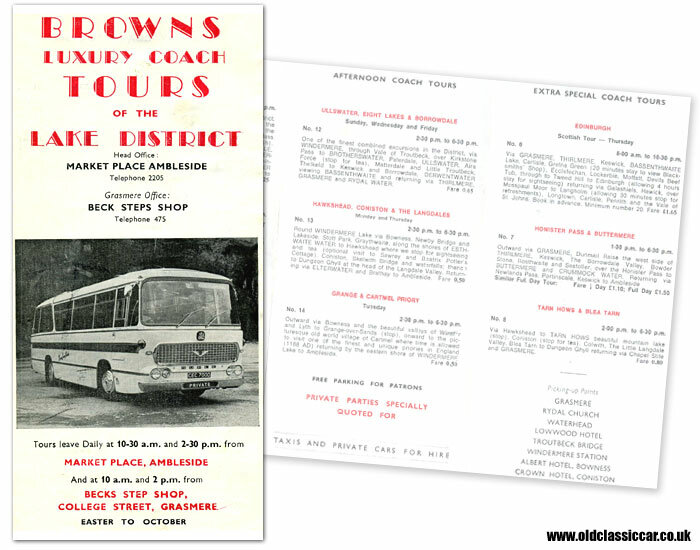 The coach, operated under the guise of Browns Luxury Coach Tours of Ambleside in the Lake District, is registered CEC 700D confirming that it entered service in 1966. The tours ran from Easter through to October, with tours departing the Market Place in Ambleside at 10.30am and 2.30pm, with further collections made in Grasmere at 10am and 2pm. Day trips to destinations such as Wastwater, Borrowdale, Ullswater and Appleby were offered, with fares ranging from £0.85p through to £1.25 depending on the trip chosen. The afternoon-only rides out commenced at 2.30pm and returned at 6.30pm, and cost in the region of £0.50p - £0.65p per person, per trip. For the truly adventurous, there were longer day trips available to distant locations such as Edinburgh, although you'd need to be ready for collection at 8am, returning back to base at approximately 10.30pm the same day. The coach illustrated is a Bedford VAM, a medium-sized, front-entry vehicle introduced in 1965. The bodywork on this example is Duple's "Viscount" offering. Three choices of engine were initially offered to buyers of the VAM, Bedford's own 300 petrol or 330 cubic inch six-cylinder diesel units, or the Leyland 400 diesel as used in the VAM 14. Bedford's 466 cubic inch diesel engine would be an option for the 1967 model year. In all some 9,000 Bedford VAM chassis were built prior to the replacement YRQ series coming on stream in 1971. What became of this classic Bedford coach? Did it go on to serve with other coach operators, or maybe - as with quite a few old Bedfords - it ended its days as a hippie wagon, touring around '70s music festivals before being consigned to the cutter's torch....? More items of paperwork relating to motoring and motoring-related services, including some related to other coach and bus operators, can be found in the Motoring Collectables section.